A variety of Wasps seem to enjoy the Fennel Nectar...a treat for me, as I regard Wasps as among the most beautiful of guest critters in our garden. 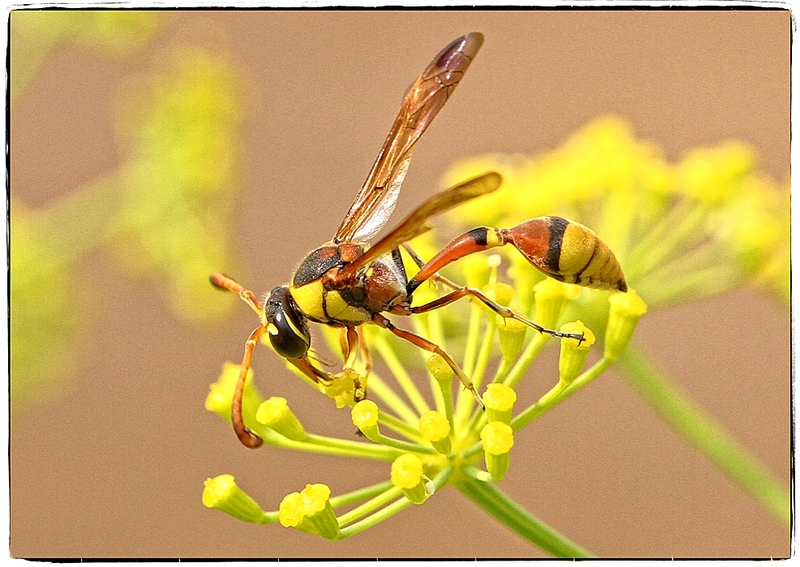 The main picture is of a Paper Wasp, slurping nectar. The bottom picture features a Mud Dauber, which is mainly a carnivore but also clearly has a sweet-tooth. There is something elegant about them! Wonderful photos! Ray: Elegant is a good descriptor for these wasps, Elizabeth. Ray: I appreciate your comment, Frank. In truth I was quite pleased with these two images. Je pense que celui-là doit piquer. Ray: Ces guêpes peuvent être douloureusement douloureuses, Martine, mais il est peu probable qu'elles attaquent à moins qu'elles ne sentent que leur nid est menacé. Je n'ai aucun problème à mettre l'appareil photo à moins de 10 cm d'eux. Both of these Wasps can sting painfully, Martine, but they are most unlikely to attack unless they feel their nest is threatened. I have no problems putting the camera within 10cm of them. Textbook examples of these two wasps, Ray. It always amazes me how their two body sections are connected by such a thing "point." Ray: You are very kind, Ginnie. The Mud Dauber, especially, has an hourglass figure. Ray: The Mud Dauber, especially, has an hourglass figure, Lisl. These are really grade one insect pictures, you steady-handed beast! Ray: I am delighted that you like them, M'Lord. Ray: Les guêpes sont parmi les plus beaux des insectes, à mes yeux, Claudine. Je vous remercie pour votre aimable commentaire. Wasps are among the most handsome of insects, to my eye, Claudine. Thank you for your kind comment. Shouldn’t it be eating greenfly? Ray: We'll have none of that nasty business in my Fennel garden, thank you, Chad! Such amazing detail in these. I like the auxiliary fuel tank that is attached to both of them. Ray: Elegants beasts, in an odd sort of a way, Alan. Ray: Insects certainly fascinate me, Bill. I am impressed with some of their skills and ruggedness, and do feel they are better equipped in many ways than Sapiens for dealing with The Apocalypse. They look like very fragile insects - our wasps seem to be rather more robust! Ray: They are very robust critters, Tom, but their slender "waist" makes them look a little fragile. I am not having SC issues at this time. They are so different from the wasps we get over her, but very well photogrphaed. Ray: I am a little surprised you don't have Mud Daubers, Brian. Ray: You are very kind, Astrid. To my eye, these Wasps have smooth, shiny bodies, so I am a bit surprised to find that the camera puts fine hair all over them! Wasps have a huge variety of abdomen (whole body, really) shapes and sizes thus they are often difficult to identify. These both have the bulbous back ends so are quite easy to sort out. Great shots. I find wasps very interesting. Ray: Wasps are wonderful critters, Mary. Thank you for your encouraging comment. the first shot is flawless in all aspects, in my opinion, Ray. really liking the yellow and black thorax. Ray: You are very kind, Ayush. Boy, you're good at this! In truth I still have much to learn, and love the challenges the genre throws up. Two excellent pictures. By the way, that mud dauber is having post meal sweets, methinks.